Aren't they the cutest?! These are my babies, Howie (left) and Aurora (right). Dogs really are a (wo)man's best friend and that sure is true for me. My two dogs are both so sweet, playful, and love to cuddle. I miss them when I'm gone, eating popcorn isn't nearly as fun without them, and they're always excited to see me. My dogs make a boring day exciting and do adorable things at least 873 times a day. We have conversations on a daily basis and I'm confident one day, they'll answer me back. I hate letting them down! That's why I want only the very best for them. Anybody who's furry friends are also their child would agree. So why wouldn't we combine two things that we love so much? Paracord and pooches! Paracord is tough enough to withstand the elements that dogs will put it though and you can completely customize what you make for them. Here are 5 things you can make your dog with paracord that both of you will love. The paracord dog collar is usually the first thing people make for their fur-babies. It's the quickest and a fun way to make something unique to your pup and you. I made Aurora a King Cobra midnight blue and mint collar. She loved it, I loved it. I wanted to show just how stylish Aurora could be! All the other dogs on the block were jealous, I know it. What's fun about the paracord dog collar is that you can make it with a bunch of different weaves, colors, patterns, and cord sizes (depending on the size of your dog). Learn how to make your own King Cobra dog collar here. We all love to take our beloved dogs on walks. They need it and we need it. Why not use a fun and customized leash? 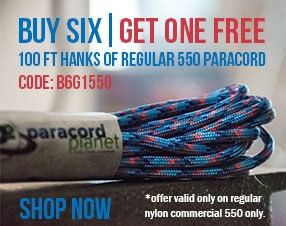 If you used our #550 cord, you'll get strength, durability, and style. With every cord you use in the weave, your leash gets that much stronger. That means that the next time your pooch attempts to run after a squirrel, you don’t have to worry about the leash fraying, ripping, or slipping from your hands. A paracord dog leash will allow you to contain your dog’s energy and keep you in control. The leash in the photo above also has extra hooks in it so you can walk more than one dog at a time with just one leash. To learn how to make your own paracord dog leash, click here. A paracord dog harness has all the same benefits of the leash and collar - strength, durability, and style. However, with the harness, you get more control over your little friend, which is especially important if you're on a busy road. The harness also discourages the dog against pulling so much because it won't pull nearly as effectively as with just a collar. Harnesses also discourages against jumping without chocking the dog. The paraknotter.com makes some beautiful, fun, and incredibly strong dog harnesses, check them out here. To learn how to make your own paracord dog harness, click here. Tip: make the collar, leash, and harness with nylon (not polyester) cord since it's smoother. Up to this point, an indestructible dog toy seemed as though they didn't exist. If your dog is anything like my dogs, toys usually only last a couple of days. What kind of material could match the strength and relentlessness of a canine’s clutch? 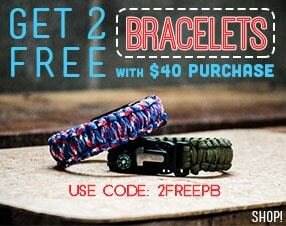 Paracord, of course. A paracord dog toy will be the ultimate test for your dog, entertaining it as it tries for hours on end to chew through the resistant cordage. Finally, you’ll have a toy that can withstand more than a few days of torment. These toys are often simple to make, and allow room for creativity as well. This is a new one for me. I've never heard of it, but let me tell you, it's a grand idea. I'm sure most of you know the struggle of trying to drive (safely) but your dog keeps jumping in the front seat, moving around trying to get comfortable, or jumping from the front to the back incessantly. My little dog, Howie, is the worst at this. He loves car rides so much, he can't sit still. With the paracord dog zip line, he would be confined to the back, but still have the freedom to move from window to window, lay down, and sit up. While the zip line in the photo isn't paracord, I think it can be made with paracord very easily. What else have you made for your furry little best friend out of paracord?